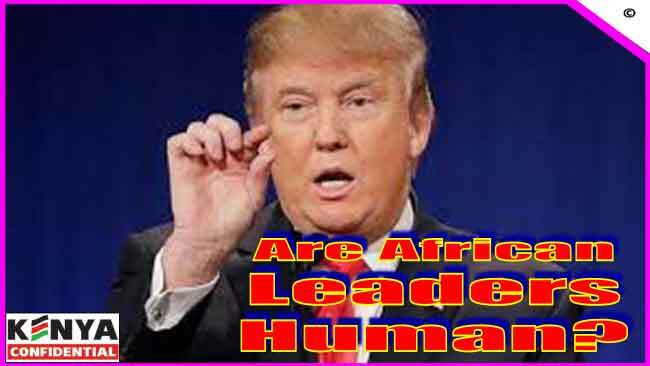 Home Better Living Tips Sunday Reading: Are African Leaders Humans? Until your leaders think less of themselves and more about you people, You are not human but animals (to them). 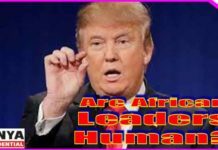 The United States President Donald Trump has posed seven questions to African leaders, which many of them cannot answer because they are perpetually driven by greed for power and self-aggrandizement. The questions must arouse concern to African populations, which are victims of their self-inflicted misery perpetuated by the leaders they vote to power. 1. If after 50 years of independence you have not built the necessary infrastructure for your people, are you humans? In Kenya that question is begging for answers in many parts of the country. 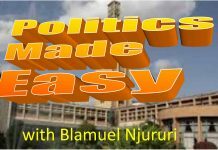 In the Rift Valley and particularly Baringo County represented in Parliament for close to 40 years by former Dictator Daniel arap Moi is a case study on how to keep voters in abject rural poverty for decades. 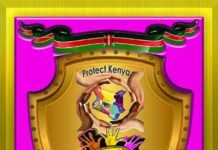 24 years of Moi as Kenya’s president of Kenya transformed him into a multi-billionaire in any currency in the world but is fellow Turgen wallow in the miasma of poverty colonialists found them in over a hundred years ago. Large populations in the Rift Valley lack basic health services and essential amenities like toilets within their homesteads. A livelihood that is common in Northern and Coastal parts of the country. Electricity is alien invention there. Most parts of the Rift Valley have no roads and the ones built during the Moi era for billions of shillings by cowboy contractors, never withstood the vagaries of the tropical use for long. In Nyanza, besides having produced the first Vice President and with huge numbers of professors, primary students attend mud-walled classrooms many without glass windows. Rural folk within a radius 10 kilometres of County capital of Kisumu scoop for water for domestic use like wild animals despite their close neighbourhood to Africa’s largest fresh water lake Victoria. The situation obtains in many other Counties where Governors live like Crown Princes of Saudi Arabia. Poverty-induced jigger-invested neighbours live a stone throw around an island of opulence known as Ichaweri in Gatundu the country home of Kenya’s first and fourth presidents. In most rural Kenya tarmac roads stretch up to the homesteads of those who have been vice presidents and cabinet ministers or senior civil servants in successive governments since independence 55 years ago. 2. If you sit on gold, diamond, oil, manganese, uranium… and your people don’t have food, are you humans? Kenya historically was not known for mineral wealth although Kakamega was taught in geography classes as far back as 1950 as a source of Gold. Oil was discovered during the Moi era but never exploited. 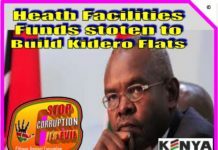 However, in the last decade of dictator Moi, massive deposits of Gold and Diamonds were discovered by a young Asian known as Kamlesh Pattni, in a place called Goldenberg International. The Goldenberg scandal was a political scandal where the Kenyan government subsidized exports of phantom Gold and exports far beyond standard arrangements during the 1990s, by paying Pattni’s company Goldenberg International 35% more in Kenya currency than their foreign currency earnings. 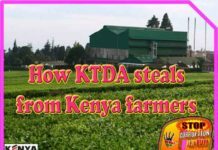 It is estimated the fraudulent racket cost Kenya the equivalent of more than 10% of the country’s annual Gross Domestic Product, and it is clear that no or minimal amounts of gold were actually exported. 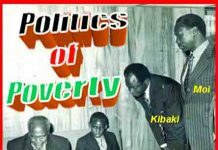 The scandal involved political corruption at the highest levels of the government of Daniel Arap Moi and later officials in the next government of Mwai Kibaki were also been implicated. They today sit pretty as newfound post-Moi era millionaires and billionaires. 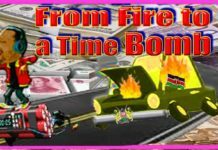 The scheme began in 1991, almost immediately after the Kenya government, following directions from the IMF, introduced measures to reform the economy and increase international trade and investment. It stopped in 1993 when it was exposed by a whistleblower, David Munyakei. Munyakei was subsequently fired from his position at the Central Bank of Kenya, and remained largely unemployed until his poverty-induced death in 2006. On 3 February 2006, following a judicial investigation under the Kibaki government, a report by Mr Justice Bosire recommended that the Education Minister at that time, Prof. George Saitoti should face criminal charges for his actions. The report also recommended that Moi should be further investigated. Saitoti was both vice-president and finance minister under Moi in the early 1990s. Saitoti’s resignation was announced by President Kibaki in a television address after the Bosire Judicial Commission implicated him. Saitoti bribed his way out of Goldenberg prosecution with Ksh 100 million through a Law firm in a house overlooking the High Court. The house hosts a Bank linked with former Nigerian President Sani Abacha Ksh 7.6 billion money laundering. In 2014 the United States froze $458 million of Abacha’s stolen cash. A Kenyan bank suspected to have handled Sh7.6 billion ($100 million) looted by former Nigerian dictator Sani Abacha is the target of an international investigation. Detectives from the Central Bank of Kenya’s fraud unit moved into Trans National Bank to establish whether it was used to launder money stolen from the Nigerian treasury by the military ruler. They are checking the bank’s records dating back to 1997 to find out who was involved in the dubious transactions and where the money was hidden. 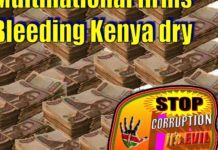 The bank – once associated with powerful people close to President Moi – was used as a conduit by money launderers to wire $100 million to banks in Switzerland, Britain, United States and other European countries. CBK investigations were never made public. As military ruler of Nigeria, the oil-rich country that dominates West Africa, Gen Abacha is believed to have looted an estimated $4.3 billion from the country’s treasury. The plunder of Nigeria’s state coffers is ranked among the biggest theft of taxpayers’ money by any government in modern times. 3. If to stay in power, you buy weapons from strangers to kill your own citizens, are you humans? 4. 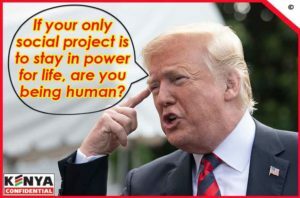 If your only social project is to stay in power for life, are you being human? Further away from Kenya after Moi’s desire to be life president was terminated by Constitutional amendment limiting presidential tenure to two 5-year terms, Africa is still grappling with Life Presidency by leaders clinging to power with Uganda’s Yoweri Kaguta Museveni, who as been president since 1986, as good example in East Africa. He is 74 years old. Further south in Zimbabwe 94-year-old Robert Mugabe was forced out of power last year since 1980. West Africa has a rich pasture of presidents clinging power for decades over their impoverished populations. 5. If you despise and shoot your own citizens like game, who will respect them? Extra-judicial executions are common when leaders feel insecure about their stay in power. 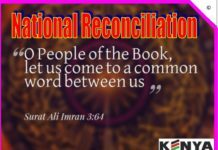 Extrajudicial killings and politically driven massacres do not earn any leader or government respect internally or in foreign eyes. 6. if you take all resources meant for development of your country for personal property are you humans? One thing most African politicians and leaders, who a few decades ago were walking to school without shoes, whose fathers had no cars or tracts of land to call theirs do once in positions of influence is to plunder public coffers and amass wealth to shamelessly enrich themselves. Once in positions of power and influence an African leader is obsessed by a strong sense of self-aggrandizement rare in many other societies. They loot their national coffers stashing millions of dollars in offshore accounts – money used by foreign countries for their prosperity while the Africans burden their countries with loans they can hardly pay back. 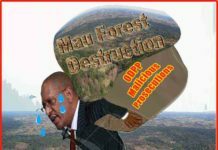 The flight of the meagre resources are further depleted with imports of luxury items ranging from the most expensive cars in the world, foreign foods, foreign clothes, foreign trips, foreign everything. Kenya has become a net importer of industrial merchandise, which it was manufacturing and exporting a few decades ago. They include matches, toothpicks, toiletries, cooking oils, and a whole array of foodstuffs as well as stable maize and rice. The political leaders and top public officers think they are entitled to the best medical care and happy Valley Lifestyle of 3As – Attitude, Alcohol and Adultery – at the expense of impoverished fellow citizens with record high unemployment rate. If you leave your country healthcare unattended and treat yourself abroad are you humans? 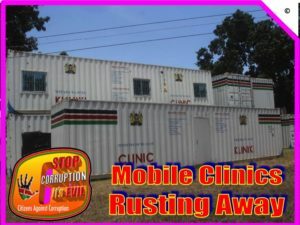 President Uhuru Kenyatta has put great emphasis on public health and affordable health services if part of his Big 4 legacy agenda but as you read this some 99 mobile container clinics worth Ksh 800 million, brought about by the Afya House scandal, will are rusting away at NYS yard in Mombasa. That is despite lack of such facilities in many slum settlements and rural areas where they were to be taken to ease the agony expectant mothers endure. They were procured more than three years ago to increase access to health services in remote areas of over 40 Counties. About Ksh 5.2 billion was reportedly lost in 2016 in the scandal. The heist involved manipulation of the Integrated Financial Management System in the partly paralyzed Health ministry. In October 2016, the Ethics and Anti-Corruption Commission (EACC) announced investigations into the alleged fraud had commenced, moments after internal audit report detailing the loss was leaked. To date the anti-graft body has not indicated if the investigations had been concluded or how soon this will be done. Reports say it had struck a deal with directors of the firm involved for an out of court settlement but no details have been made public.